Molten Chocolate Cake or Un-Molten Chocolate Cake ... What's Your Pleasure? What do you get when you are making gluten-free Molten Chocolate Cake and you leave out the butter (or in my case, coconut oil)? Well, you don’t get Molten Chocolate Cake, but you get something pretty wonderful. At least that’s what I and my three co-workers think! I started out making Molten Chocolate Cake—a recipe from Brooke Parkhurst, the owner of the dedicated gluten-free Triple Oak Bakery—before work this morning. (I like baking in the mornings because it’s very quiet and I can catch that early morning light for my photos.) 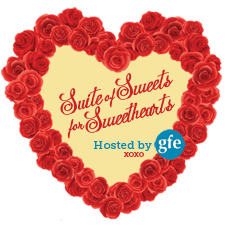 It was going to be today’s entry for Suite of Sweets for Sweethearts. However, as I was folding the chocolate mixture into the whipped egg whites, I saw the coconut oil still sitting on the stovetop. Uh oh! I had a secondary flash of panic, but then I thought of chocolate mousse and lighter desserts like chocolate pavlova, so I told myself to “roll with it, Shirley” and continued on. I’m very glad I did. I enjoy Molten Chocolate Cake as much as the next person, and it can feel like you’ve won the lottery when you discover it on the dessert menu at fine restaurants (always ensure gluten-free status, of course). But sometimes dessert should be lighter, but naturally so. 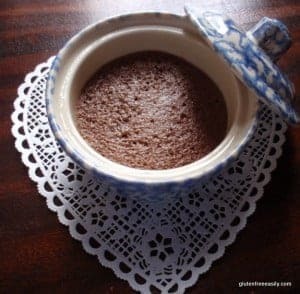 This accidental dessert, which I’ll call Un-Molten Chocolate Cake, is similar to a chocolate mousse or classic flourless chocolate cake in texture and its lovely chocolate taste, but it’s much lighter overall. It’s airy and somewhat sponge-like, but delightfully so. 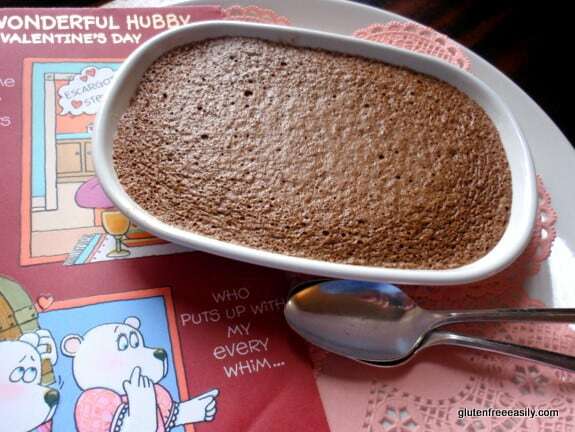 My presentation of this dessert is obviously very simple, but if you want something more eye-catching and impressive, you can easily dress this Un-Molten Chocolate Cake up with some raspberry coulis, some sliced strawberries or whole raspberries (in a heart pattern, perhaps? ), a drizzle of a dessert wine, or a dollop of coconut whipped cream (either Honey Whipped Cream or Honey Cinnamon Whipped Cream would make a lovely topping). You can scroll down to get both recipes—“mine” and Brooke’s—immediately if you like. But let me share a little more about Brooke Parkhurst. Brooke has celiac disease and has been gluten free for many years. She previously served as the pastry chef at Four and Twenty Blackbirds, an acclaimed, but now closed restaurant near where she lives. You can read more about Brooke here. Her Triple Oak Bakery has been in operation a few years now. It’s in charming Sperryville Virginia in Rapphannock County, which is considered the foothills of the Blue Ridge mountains. We pass by it going and coming on the way to our mountain property (but usually not during its hours of operation). Brooke gave a great baking presentation to my support group last year. 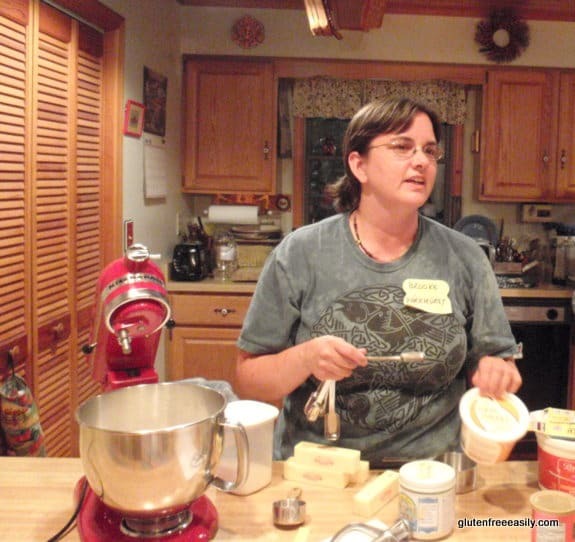 She shared her own culinary history, favorite resources, and tips with us … talking away, all the while making scones. To create scones, she simply uses her favorite biscuit recipe but alters it slightly by adding ¼ cup to ½ cup of sugar (amount is dependent upon personal taste and/or what other ingredients were being added) and forms the dough into a thin circle before cutting into wedges. One of our families (long-time friends of Brooke) had brought some of their own fresh blueberries to share for our group meal, so she added about a cup of those to the dough to make blueberry scones. As we were nearing the conclusion of our meeting, she pulled the scones out of the oven. Yes, hot blueberry scones for our dessert and “closing” that evening. They tasted so good and we were so grateful! Brooke also brought several other of her baked goods, some to share and some to sell. There were Chocolate Chip Pecan Cookies, Brownies, and more that I can’t recall, but my favorite was her Lemon Poppy Seed Cake. Here’s a quick synopsis of what Brooke shared with my group. ~ She has always relied on her own gluten-free all-purpose flour mix; it’s a mix of rice flour, potato starch, and tapioca starch/flour. More recently, she has used arrowroot powder instead of potato starch to accommodate regular customers who can’t tolerate potatoes. When baking, she usually adds ½ tsp xanthan gum for every 2 cups of her flour mix. ~ There are lots of ways to “glue” gluten-free baked good together besides xanthan gum. Brooke suggests adding another egg, using ground or whole chia or flax seeds to make “chia eggs” or “flax eggs.” She says that you can also add one packet of unflavored gelatin for every 2 cups of flour mix. Agar, a gelatinous substance from seaweed, may also be used. Last, sour cream, cream fraiche, or yogurt may be used instead of liquid to moisten and bind baked goods. ~ When looking for new recipes, explore cuisines that may use less wheat; e.g., Indian, Thai, Japanese, Afghani. Adapt recipes to be 100% gluten free. Changes may not even be needed. ~ Always look for dishes that have little or no flour as they will convert more easily with fewer or no texture issues. She cited Sponge Cake and Angel Food Cake as easy recipes to “convert,” and, of course, Flourless Chocolate Cake. ~ Some of her favorite online resources are Epicurious, Tastespotting, Cooks Illustrated, and Cooks Country. 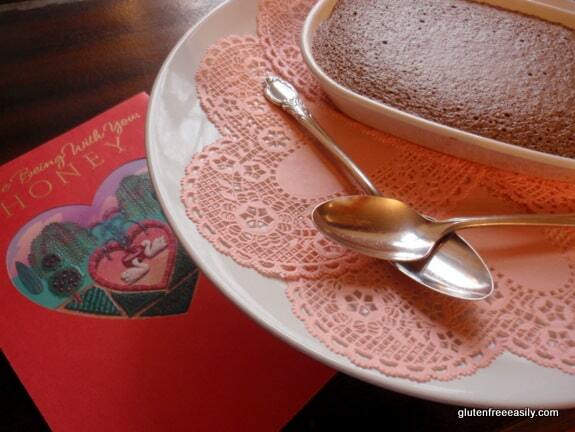 Many thanks to Brooke for sharing her Molten Chocolate Cake recipe and her tips! You can find Triple Oak Bakery “in real life” in Sperryville Virginia and their baked goods in numerous other locations. They even deliver twice a month to the Northern Virginia area; read more here. You can also sign up for Triple Oak Bakery‘s emails, in which Brooke shares what the bakery is offering that week, her schedule of cooking classes and other events, some recipes, and lots of inspiration. Incidentally, Maren, my support group’s youngest regular attendee and the gluten-free baker at our local farmers market learned how to make apple turnovers from Brooke last year in a one-on-one cooking class. Maren’s been making them every week as one of her offerings at the farmers market and everyone loves them! 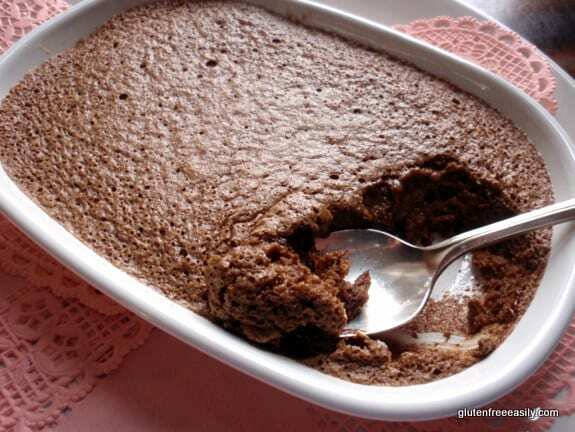 Here are both recipes—my adaptation of gluten-free Molten Chocolate Cake that is pictured with all the photos and Brooke’s original recipe. Both are naturally gluten free and naturally grain free. And both can easily be made dairy free and/or refined sugar free. I don’t think you can go wrong with either! Preheat oven to 400 degrees Fahrenheit. Lightly grease 3 ramekins with butter. Melt the chocolate in a double boiler and let cool just a tad. In one medium-sized bowl, beat the egg yolks and sugar and mix into the chocolate. In a large bowl, beat the egg whites until they form soft peaks. Pour the batter into the ramekins until they are about 2/3 full. Bake in a preheated 400F oven for about 7 minutes. Let cool according to your personal preference or schedule. Eat right out of the ramekin with a spoon. Dress up/fancify with some raspberry coulis, some sliced strawberries or whole raspberries, a drizzle of a dessert wine, mocha syrup, or a dollop of coconut whipped cream (either Honey Whipped Cream or Honey Cinnamon Whipped Cream would make a lovely topping). The classic flourless grain-free chocolate cake. Lightly grease three ramekins with butter. Melt the chocolate into the butter in a double boiler and let cool just a tad. Beat the egg whites in a bowl until they form soft peaks. Pour the batter into the ramekins, no more than 2/3rds full. Bake in a preheated 400F oven for about 7 to 10 minutes. The outside will be set and possibly crack and the inside will still be liquid. Some nice variations on this are adding chili and cinnamon for a spicy flair (as seen here), a raspberry coulis or perhaps some delicious whipped cream. 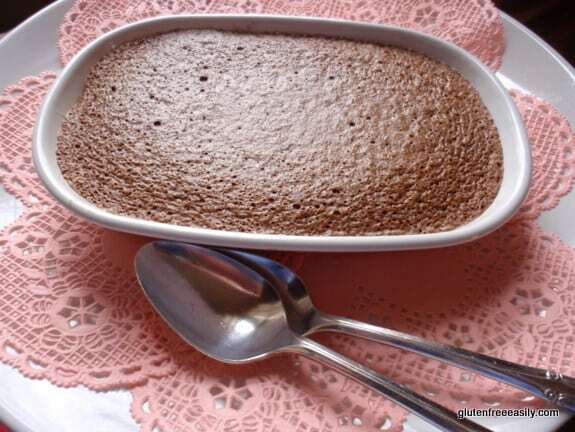 This dessert is so simple that anything you put on it will taste absolutely marvelous. In addition, you can prepare the batter days ahead of time and cook it the night of. One warning though, I've found that it is sometimes a little difficult to get them out of the ramekin so if you find a way to do it better, then please tell me! Originally published February 8, 2012; updated December 30, 2017. Now I have a sizable backlog of things that I just MUST make – they all look way too good to pass up! Where to start…..hmmm….. Seriously, these look awesome and just in time for Valentines! Hi Angela–I think you’ve been doing great on trying out gfe recipes so far! 🙂 Either version of this cake is super easy to make so you can take them off the backlog list quickly. 😉 Yes, please let us know what you think! What a happy accident. It does look light and airy. Thanks, Kalinda! I’m tickled that you chose this recipe for your weekly gf/vegetarian roundup. 🙂 There were SO many great ones this week! Thanks for the great recipes. By the way where did you get that great little blue and white ramekin with the lid? Must…try…cake…. Lol. Dangit, Shirley, it looks so good. Maybe this will be my valentines day thing. I have some heart shaped baking cups that never see the light of day. This looks amazing! I’ve been experimenting with different subs for xanthan gum – I only wish I could use eggs in recipes for Tony! Looks divinely delicious! I’m glad you shared both recipes with us Shirley…will have to try these soon too. Oh, no, I’m sorry about CanCan. Finding a crouton in one’s salad is one of the worst experiences! A good tip is to follow the directions that the Outback family of restaurants give and request that your salad be newly made in a different bowl. When you ask for that, usually the light bulb goes on, as many gluten-full ingredients can get thrown into one big bowl and then that’s used to serve from. 🙁 I’ve only eaten at CanCan once, but it was a great experience that time. Just a caution about “good quality chocolate”, not all of the good quality chocolates are gluten free. Check before using! What a happy accident indeed, two recipes for the price of one! Ha this post made me giggle a bit. We’ve all left out that one supposed important ingredient and ended up with some random weirdo final product. Sometimes it’s a total hot mess, other times you end up with an amazing happy accident result. So congrats on an amazing happy accident cake 🙂 It looks delicious and airy. Beth–I suppose we all have, but not everyone admits it! 😉 “Total hot mess.” LOL Yes, sometimes that’s the case. I was just reading that cake wrecks can be used to make cake pops. Now that’s a great way to use the results of a “failed” recipe! Yum, yum, yum. Looks wonderful. Thanks for sharing the great tips too! By the way, I love all of Brooke’s ideas for binding gf baked goods without xanthan gum. I had recently tried the gelatin in my calzone dough and was amazed at the results!! Good to know on the gelatin. I have heard that before. I’m now craving calzone–thank you! 😉 Will that be on your blog? (She says with her fingers crossed … it’s hard to type with crossed fingers!) Have you tried psyllium husks or powder yet? I’m going to get some as soon as I go to the pharmacy again. Looks so delicious! Anything with chocolate and I am in. I love how you just went with it and a ‘mistake’ turned into something wonderful, Shirley! That’s great inspiration for us all! Your Un-Molten Chocolate Cake looks gorgeously light and flavourful. My mouth was watering reading about the treats from the Triple Oak Bakery – I wish it was closer to where I live! Sharing your post. Thank you for being a part of the Hearth and Soul Hop. Thanks, April! I have to say that some of my best creations have come from mistakes, so even when they don’t all turn out to be “something wonderful,” I laugh and keep on keeping on. 😉 Oh, yes, Triple Oak Bakery is a treat. They’ve even been featured in Saveur! That is delicious chocolate cake. Thanks for sharing with Hearth and soul blog hop. pinning.